Hospitality is as old as humanity itself. Ever since man began traveling the Earth he has needed a place to stay. Innkeeping can be found in all cultures around the globe, and it is mentioned several times in the Bible. Convents and monasteries all over Christian countries considered hospitality as a sacred duty. A certain number of monastery doorkeepers were even canonized. Inspired by the monastic example, innkeeping was a very personal affair until the twentieth century. An inn was often little more than a family that opened up part of their house to travelling strangers. The owner’s wife and daughters cooked simple yet hearty meals for their guests. His sons might serve the table, take care of the stables, and perform other manual tasks. The inn may not have had the latest technology or the finest china, but guests truly felt served and welcomed with warmth and charity. Portraits and other charming relics of family history often decorated the interior. The house may have been built by a revered ancestor, with the personal style and taste of the family in evidence throughout. Perhaps a game trophy hangs above the fireplace. The family members were probably born under its roof and would almost certainly die under it. Hence the allure of the traditional, family-run inn. 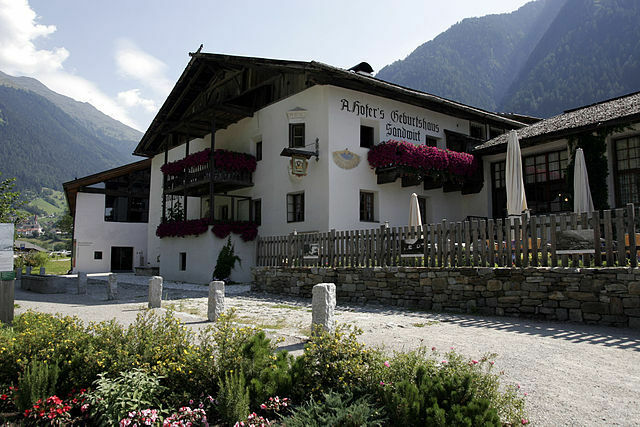 An example of one is the Sandhof Inn in the Austrian Tyrol, once owned by the family of Andreas Hofer, the famous Austrian leader who fought against Napoleon. Judging by its design and decoration, the Sandhof truly reflects the alpine personality of the Austrian people and of the Hofer family from which it draws its fame. Everything about it, from the window flowers and garden to the wooden roof to the portrait of Andreas Hofer himself hanging from the outside wall suggests an unpretentious human touch that is so appealing to many modern travelers. It is a glimpse into a time when staying at an inn was not, as it is today, a mere business transaction between a “consumer” and some impersonal, multi-national hotel conglomerate. Rather, it was an opportunity to participate in a human-to-human interaction, for a family to serve a weary traveler regional treats like local cheese, the family’s traditional ham or sausage, or their wine – all not found anywhere else – or even an occasion to make a new friend along the way. 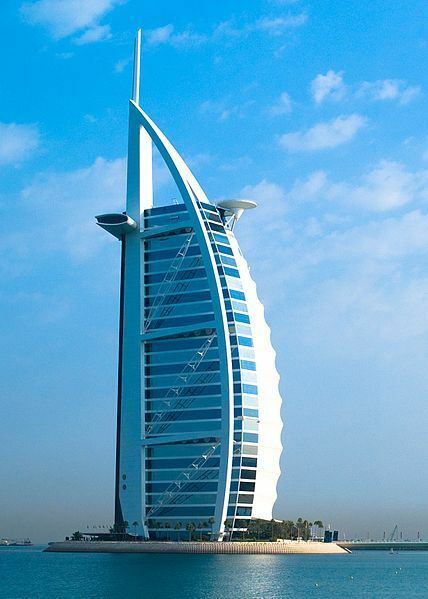 How different is the modern hotel experience, such as the Burj Al Arab Hotel in Dubai. The Burj Al Arab Hotel certainly cost much more to build than the Sandhof. Since money is the supreme value of modern society (and is particularly important in Dubai culture) it was important to the builders that the material wealth of the hotel be as dominant and conspicuous as possible. Like most modern buildings, its interior and exterior construction was intended to shock and impress visitors with its eccentric shapes, colors, and materials. Like a piece of modern art, its extravagant design expresses an esoteric meaning that is only fully understood by the designer himself, certainly not by the ordinary observer. Although the Burj Al Arab Hotel is the embodiment of the moneyed “jet-set” of the twenty-first century, its design shares a radical materialism with twentieth-century socialist ideology. Its sweeping size proudly declares the supremacy of matter over spirit, not unlike a communist-era “Palace of the Soviets” built by Stalin in Moscow or Warsaw. This effect, coupled with the almost totalitarian extravagance of its physics-defying shape, doesn’t inspire deep reflections like the immense nearby desert sands or picturesque camels resting by an oasis. Rather, the hotel reminds guests of their insignificance before the supposedly all-mighty dollar (or the “dirham”, in this case) and reminds them of their duty to bow down before it, just like everyone else. Most importantly, this hotel exudes a very different spirit of hospitality than the Sandhof. Its highly paid employees are certainly instructed to put on Colgate smiles and greet guests with a scripted welcome. But the artificial smile and memorized greeting always fall short compared to a genuine personal connection found at a traditional, family-run inn. A guest may feel contented knowing that he is staying at one of the wealthiest hotels in the world, but he will never escape the inkling that his money is the one and only reason for the VIP treatment he is receiving. In short, the Burj Al Arab Hotel does not offer genuine hospitality with its cold, impersonal and materialistic social exchanges. The hotel is a trophy to be checked off a jet-setter’s “bucket list.” Traditional, family-run inns like Sandhof, on the contrary, are an opportunity to make a personal connection with a real family with a real history, something that only now are we as a society discovering the importance of.